The MM was something of a bust this year. Instead of bitter wind chills or an observing field buried under a foot of snow, conditions were actually quite pleasant. But there were those clouds. Patches of opaque clouds gave way shortly after nightfall to a succession of semitransparent bands that simply wouldn't stop obscuring large chunks of the sky. 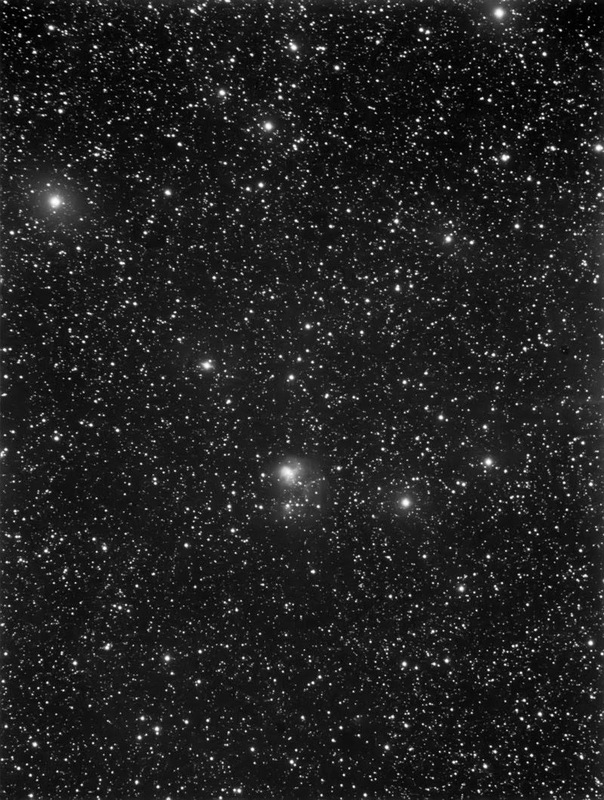 For the most part I could shoot through the clouds, but visual observers were shut out of all but open clusters and the brightest nebulae and galaxies. Seeing was suggested to be poor, too. And then there was the wind. Southerly and modest at first, as a cold front passes they turned and gusted to almost 30 miles per hour. My autoguider struggled but held its own against this for the most part--a few frames had to be dropped because of poor tracking. I started the evening with thoughts of doing some MM work myself, but conditions ended that possibility. 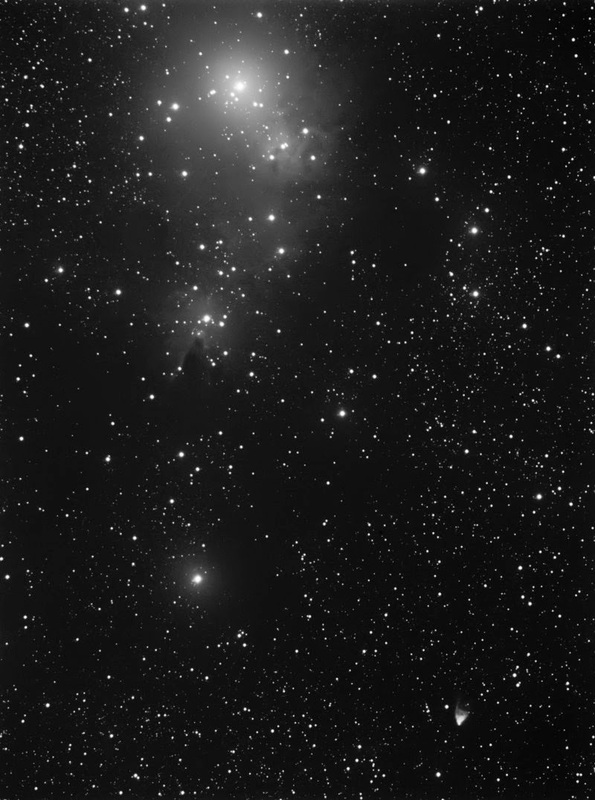 Instead I concentrated on imaging the brighter winter objects of the ALBN. This is the end of any chance to get more winter objects unless the skies clear quickly. Still, this winter netted eleven objects, leaving me at an ALBN list count of 87 done, 13 to go. Next up are some large LBNs that will test my still unused 200mm Olympus lens. 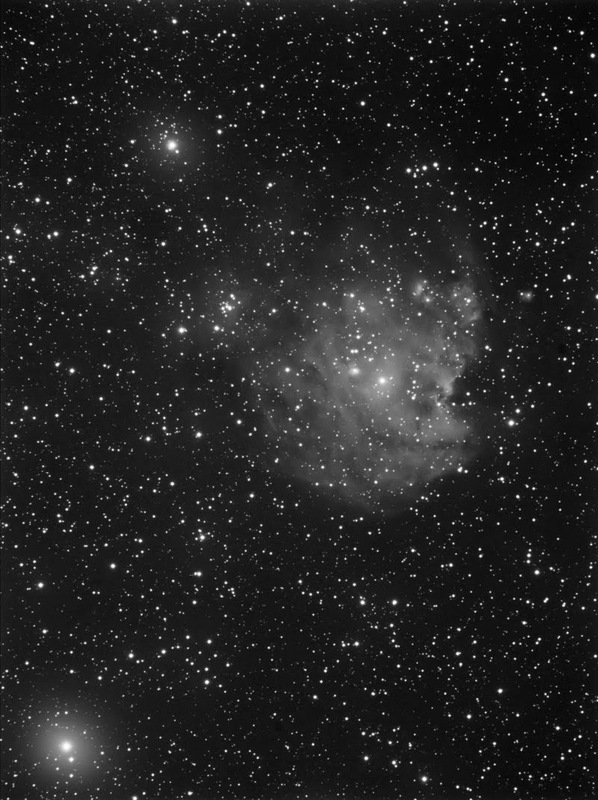 LBN 1088 (200mm); a combo shot of LBN 1089 and 1090 (135mm), then another 200mm combo of LBNs 89 and 90. Can't see the "Monkey?" It's more evident when shown south-upward instead of north-up as in this image. Some clouds here, too; the glow around 68 Ori (at lower left) is theirs. Still some cloud effects. This deserved a longer focal length, but I wasn't about to swap telescopes at midnight at a remote site. An eventual overcast forced me to stop this sooner than I wanted. I packed up and left the field at 1:23. I was the last to leave, which tells you what sort of MM it was. A nice get-together, a good no-pressure night for some of the club's beginners, some so-so imaging, and a spectacular fireball that lit up the sky. All of which were better than a -25F wind chill.